Sarty, Roger. "St. Roch". The Canadian Encyclopedia, 04 March 2015, Historica Canada. https://www.thecanadianencyclopedia.ca/en/article/st-roch. Accessed 20 April 2019. Taking a treacherous southerly route through the arctic islands, it was trapped in the ice for 2 winters and did not reach Halifax until 11 Oct 1942. It was the second vessel, after Roald AMUNDSEN's Gjoa, to traverse the Northwest Passage, and the first to make the voyage west to east. 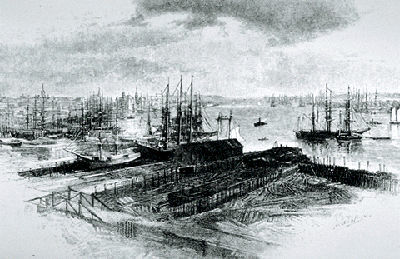 Henry Larsen sailed the St. Roch through the Northwest Passage, the first to accomplish the feat from west to east (courtesy Maritime Museum, Vancouver). 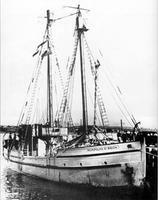 St. Roch, wooden schooner powered by sails and an auxiliary engine, launched in North Vancouver in Apr 1928 for ROYAL CANADIAN MOUNTED POLICE operations in the Arctic. Under the command of Sergeant Henry A. LARSEN, it sailed 23 June 1940 from Vancouver to traverse the NORTHWEST PASSAGE. The St. Roch returned to Vancouver by a more northerly route, through LANCASTER SOUND and Barrow Strait, in only 86 days (22 July-16 Oct 1944). This voyage made it the first vessel to negotiate the passage both ways. The exploits of the St. Roch strengthened Canadian ARCTIC SOVEREIGNTY. In 1950 the St. Roch made a southern voyage and thus became the first ship to circumnavigate North America. It was purchased by the city of Vancouver in 1954 and permanently berthed at the Maritime Museum. The federal government declared the St. Roch a national HISTORIC SITE in 1962. Vancouver Maritime MuseumExplore the rich maritime history and traditions of the Pacific Coast at this Vancouver Maritime Museum website. Click on "Virtual Tours" to step on board Canadas famous RCMP schooner St Roch and other museum exhibits.